The National Parks Service seems to be marching closer towards killing off an enormous portion of Fire Island white-tailed deer. 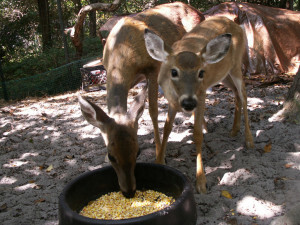 Deer lovers on the barrier island off New York have feared since 2012 when the federal agency announced it was coming up with a plan to “manage” the deer population that there was only one way this was going to go. The Parks Service announced on December 31–talk about a late night news dump–that despite years of deliberation and 400 pages of public comment, they are planning to kill off one-third to two-thirds of the deer population. And then come back and do it again. And specifically target deer that approach humans, which seems especially cruel. It’s also a way to interfere with the natural evolution of a species in an world that is dominated by one species, humans. It didn’t need to happen at all. Much of the comments are angry at the idea the Parks Service is going to kill wildlife in the name of protecting the grounds of an historical estate and to try to recreate an exact moment in the natural history of the island–after humans had killed off the large predators, but before deer and other prey species thrived in their absence. In the parks service view, a natural environment and balance that require constant human intervention and shooting is preferable to whatever happens naturally. There’s a last ditch change.org petition to try to stop killing the deer, though that seems hopeless. The Parks Service decided a long time ago they wanted to shoot the deer on Fire Island and that’s what they’re going to start doing.